When Uber’s Singapore headquarters moved into its new 55,000 sq ft office to Guoco Tower, the tallest building in the country, it needed a workspace that could meet its rapid growth and reflect its progressive approach. It needed an office that not only wows with its design but also boosts employee productivity. Here are three ways Uber realised its vision of an office design that engages employees and wows visitors. The Uber office features an open-concept design, which helps create a connected, spacious environment. It features large areas comprising dedicated group workspaces, equipped with writable walls, that facilitate ideas sharing between co-workers. The positioning of interior walls to create dedicated workstations for individual groups also promotes collaboration and a sense of togetherness. An open space breaks down any office hierarchy as well. This allows employees to socialise and engage with each other, which in turn, helps boost office morale and productivity. A key feature in the Uber office that encourages collaboration is the multi-purpose amphitheatre. A space that can be used for a variety of meetings and events, it boasts plenty of room for employees to work together. A 2017 study by researchers at UCLA, University of California, Riverside and Washington University found that when employees participate in their company’s wellness programmes, their productivity can improve by up to 11%. At Uber’s Singapore HQ, swiveling, shifting walls open up to create new spaces that facilitate wellness activities. The stepped amphitheatre space, for instance, doubles as a yoga centre. Besides physical fitness, the design includes elements that addresses mental health and promotes mindful living as well. This is seen in the wall design that features black-and-white graphics, turning these surfaces into a giant canvas, on which employees can draw and colour. According to Baste, “The design team’s vision from the start was to create vistas that visually connected the inside spaces to the outside panoramic views.” This is achieved through strategically placing interior partitions and rooms away from the full pane glass windows ensuring that natural light fills the office. Based on a study by the American Academy of Sleep Medicine, office workers also sleep longer and better, are more physically active, and have a better quality of life when they are exposed to more sunlight (as opposed to artificial light sources). Besides encouraging a healthier, more wholesome lifestyle, natural light also makes us more alert throughout the day and prevents staff from falling asleep on their desks, which means higher employee productivity. 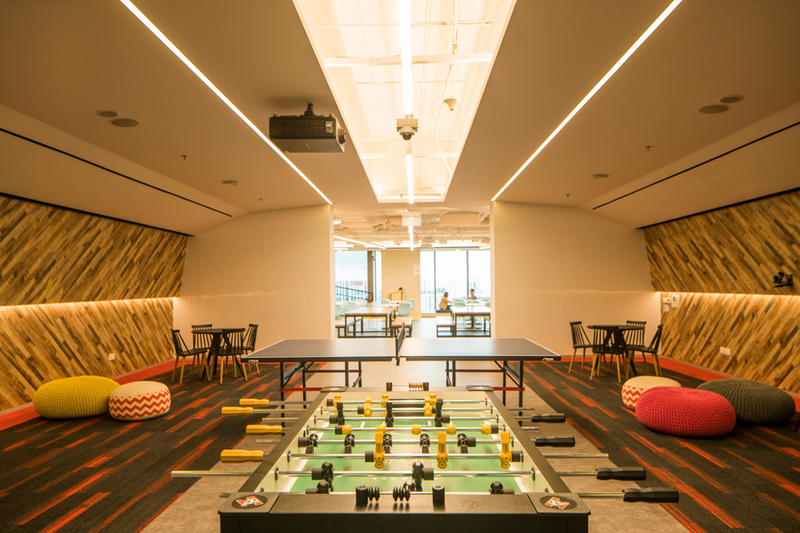 Throughout designing Uber’s Singapore office, Space Matrix took inspiration from the company’s latest brand statement – “We leave no bit or atom unturned to create industries that serve people and not the other way around” – to create an effective workplace that reflects how “Uber strives to serve people and the broader communities through technology integration”, said Baste.